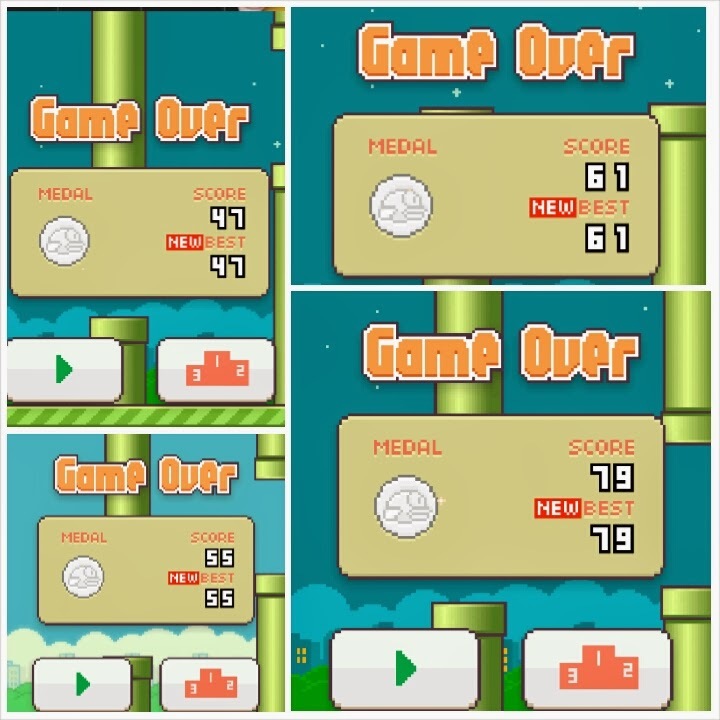 Recently (two nights ago to be exact) I've been playing this new and popular mobile game application called Flappy Bird. Oh yes! I got hooked too! Are you playing it too? I bet you are. But if you haven't yet because you are not one who joins the bandwagon or simply because you don't have time or because you think you won't be able to handle the frustrations your friends feel when you see their Flappy Bird posts on social media, then you might give this game a chance after reading this post. While for others (ok I admit I'm one of them) this game is just really addicting, I feel that it could do more than just serve as an entertainment or something to pass time with. You may be unaware but Flappy Bird could actually leave you valuable life lessons. Let me enumerate what I've taken away with this game. 1. Life will always have its UPs and DOWNs. Just as your Flappy Bird goes through one pair of pipes after the other, you navigate it by flapping up and down. It reflects how life is, sometimes we're up and happy about everything. But at some points in our lives we're down, either with sickness, heartbreaks, failed projects or worst, death in the family. We just have to go through all of them in our lives and accept that they are parts of living. 3. Perseverance, focus, and patience are important keys to success. To get to the top or be the successful business person you aspire to be, right attitude, hard and smart work are needed. There's no such thing as overnight success. Work for it. Just like when you get a medal for your high scores at Flappy Bird, it took you those traits mentioned to be able to achieve them. 6. Practice does not make perfect, but it does train you to get into the rhythm of life. Fine, first up to my 20th tries on Flappy Bird, I got 0 to maybe 10 scores only. But practicing over and over got me into the flappy rhythm and sooner or later, it made me reach scores higher than 30. This lesson applies to life too! You don't always get everything right away at one to two tries. It takes practice. Just like when I breastfed my toddler, it was painful and hard at first, but after many tries coupled with the desire to give the best for my child, I succeeded and actually enjoyed it so much because I know that I'm giving him the best milk mother Earth could ever have. 7. When life hits you at any point in time and you’re at rock-bottom, you can always start again. 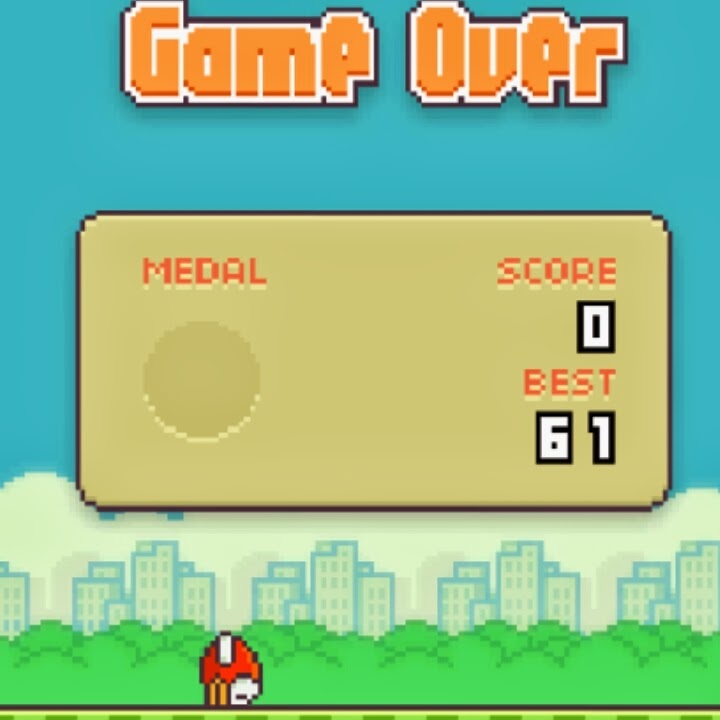 Doesn't it irk you when the GAME OVER sign flashes on your mobile phone screen when your Flappy Bird hits one pipe? But what do you do? You press the play button and start all over again! In life, there will be some point when you will feel pain from a relationship breakup, or for instance a failed marriage, but in order to live, you got to pick yourself up, move on and start all over again. As the song goes, "starting over again, it's not the easiest thing to do.." it's true! But when you have faith in the Lord you could do it. Seek support from family and friends, you'll survive. I've been a single mom to my son Dandre for several years after the failed marriage. I started all over again, came out of the situation as a stronger woman and didn't let the life tragedy ruin me. Remember, when you're down, there's no way to go but up! Start all over again. Very good, thanks! Your posts inspire me to write (and play games). Hope you're doing well and best of luck on the blog. Never played this but I think your post is more interesting than the game itself. Haha. Really deep thoughts coming from one frustrating game and really good too!